or possibly since the oil shock of 1973; of placing communities across the Jewish diaspora in mortal danger, by making them targets of Iranian-sponsored terror attacks, as they have been in the past, in a limited though already lethal way; and of accelerating Israel’s conversion from a once-admired refuge for a persecuted people into a leper among nations. Israeli policy makers do not necessarily believe that Iran, should it acquire a nuclear device, would immediately launch it by missile at Tel Aviv….The challenges posed by a nuclear Iran are more subtle than a direct attack, Netanyahu told me. “Several bad results would emanate from this single development. 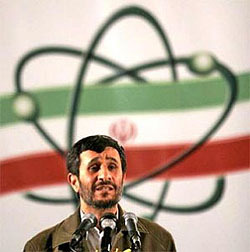 First, Iran’s militant proxies would be able to fire rockets and engage in other terror activities while enjoying a nuclear umbrella…..Second, this development would embolden Islamic militants far and wide, on many continents, who would believe that this is a providential sign, that this fanaticism is on the ultimate road to triumph. “You’d create a great sea change in the balance of power in our area,” he went on. An Iran with nuclear weapons would also attempt to persuade Arab countries to avoid making peace with Israel, and it would spark a regional nuclear-arms race. “The Middle East is incendiary enough, but with a nuclear-arms race, it will become a tinderbox,” he said. I assume this is the best case they can make, and it’s pretty unconvincing. In fact, the only compelling part of it is the part that’s always been most compelling: that it might spark a nuclear proliferation nightmare. “If Iran gets a nuclear weapon,” Hillary Clinton declared a few months ago, “then other countries which feel threatened by Iran will say to themselves, ‘If Iran has a nuclear weapon, I better get one, too, in order to protect my people.’ Then you have a nuclear arms race in the region.” Saudi Arabia is usually touted as the most likely country to follow up, followed by Turkey. This is what I was talking about when I said that I’d believe American attitudes toward foreign adventurism had changed only “when something actually happens overseas, a president tries to build support for intervention, and Congress and the public—including Joe Klein and me—balk.” But I’m not sure. Will Joe Klein and I — and most of the rest of the country — balk at this if and when the time comes? Probably. But I’d be less than honest if I said I knew for sure.